EUS-guided biliary drainage with antegrade transpapillary metallic stent is demonstrated in 2cases of malignant, biliary obstruction. Case 1 was a patient with failed ERC due to a long, tight distal CBD stricture. Case 2 was a patient with post-Whipple’s anatomy and recurrence of adenocarcinoma at the hepatojejunostomy. Standard ERC failed due to inability to intubate the afferent limb. In both cases, dilated intrahepatic ducts were identified at EUS. 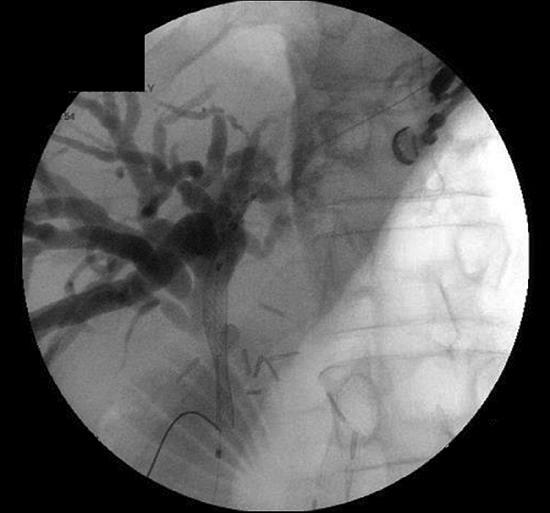 Cholangiogram was performed by injecting contrast after puncture with a 19g needle. A distal stricture (CBD and CHD respectively) was identified in both cases. A 0.025 inch guidewire was passed through the needle and across the stricture followed by balloon dilatation of the stricture with subsequent placement of an uncovered self-expandable metallic stent in an antegrade fashion across the papilla and hepatojejunostomy respectively. The 2 cases represent clinical scenarios commonly encountered during a failed ERC. EUS-guided stent placement is a minimally invasive alternative for achieving biliary drainage. Currently available EUS-guided biliary drainage techniques include choledochoduodenostomy, hepatogastroscopy, rendezvous retrograde transpapillary stent placement and antegrade transpapillary stent placement. The Antegrade transpapillary technique does not require manipulation of the papilla and therefore may be less traumatic. It is also an efficient technique as wire or endoscope exchange is not required. Most importantly, it is feasible in patients with duodenal obstruction or altered gastrointestinal anatomy. However, despite its advantages and comparable success rates, antegrade transpapillary stent placement is the least commonly used technique in the reported EUS-guided biliary drainage literature. Our video series highlights and demonstrates the technique and advantages of antegrade transpapillary stent placement.